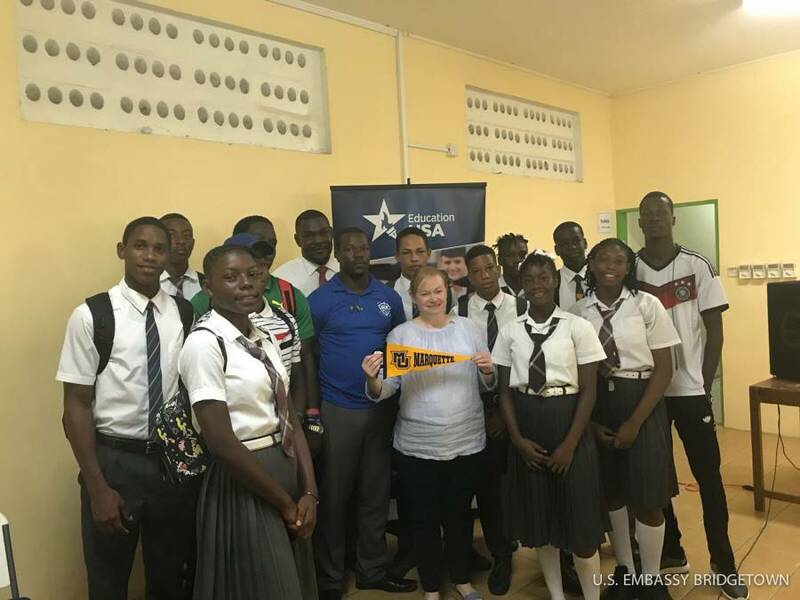 The US Embassy hosted a series of workshops in Barbados, Grenada, and Antigua focusing on the recruitment process for student athletes aspiring to study and play sports at US colleges and universities. Susan Whipple, Assistant Director, Office of International Education, at Marquette University was the facilitator of the workshops and worked with coaches, guidance counselors, and student athletes and their parents to demystify the process. Whipple provided a thorough overview of student-athlete admissions protocol, and shared inside tips on the admission office’s decision-making process. These workshops were critical and timely, as the dual admissions process awaiting student-athletes is often complex, lengthy, and regulation-laden. Student athletes attending the session in Grenada also had the opportunity to hear from co-presenter Walt Williams, a former student athlete. He spoke about his experience navigating the admissions process, and his overall experience as a student-athlete in the United States.